I saw two good-sized Gila Monsters and a four-foot rattlesnake during this evening's bicycle ride around Saguaro National Park. I won't stop for the rattlesnakes, but I did manage to get a photo of this little guy as he was crossing the road. 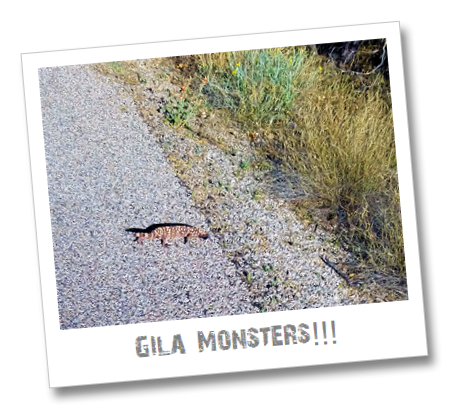 And of course, this leads to the question: "Why did the Gila Monster cross the road?" Because of his crimson hide. He was chasing some stinkbugs and flies. If he bites you you'll swell up and die.